As I’ve said before, I’m a bit obsessed with The Peach Truck peaches. They are TOO GOOD. I love getting a bag and then seeing what I can do with these little puppies. This is one of my favorites so far. I made a batch of this salsa and ate some for dinner then lunch the next day, and then it was gone – oops. I didn’t even share it with ANYONE. ALL MINE!!! I paired it with quinoa black bean chips from Trader Joe’s. So good!! I found the original recipe on Pioneer Woman and made just a few adjustments. Raw onions don’t do me well, so I replaced that with green onions, and since I used fresh peaches – I added a dash of maple syrup at the end to give it a little juice and sweetness. This is a perfect snack, app or addition to a fun Mexican dinner! 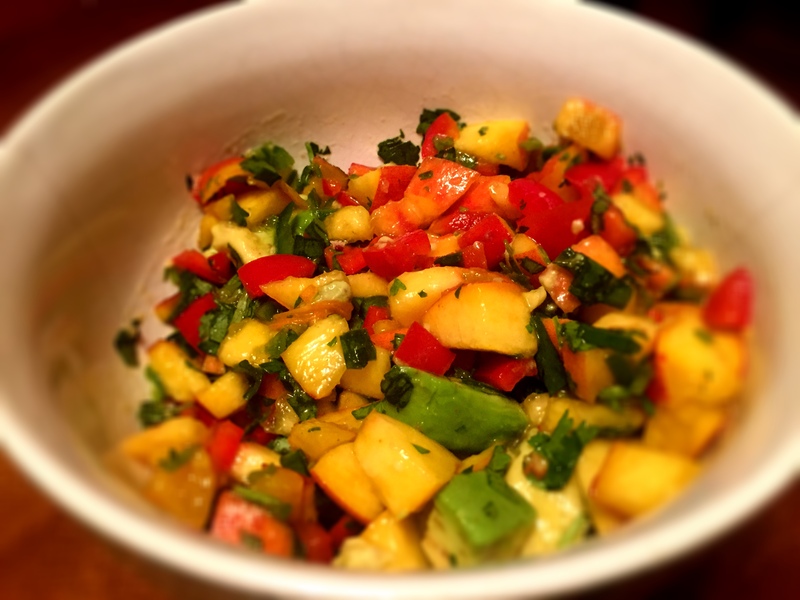 Chop up the peaches, bell pepper, onion jalapeño and cilantro. Add all of the chopped ingredients to a bowl and add in lime juice then stir. Dice your avocado and add to the mixture. Mix lightly but don’t squish the avocado. Add your chipotle pepper and maple syrup and mix lightly! DONE!